Our A2 Poster Snap Frames clip open graphic replacement, while your snap frame remains wall mounted. They are aluminium, with a 1.5mm rigid PVC back panel and a UV grade anti glare PVC cover. Our A2 Snap Frames are supplied with fixings, which are hidden behind the snap frame when it is mounted. Our Stock Snap Frames are individually boxed. Available in red, white, black, green, cream, yellow, silver and gold, bespoke colours can be ordered. You can also select snap frames by colour. Order online for next day delivery. 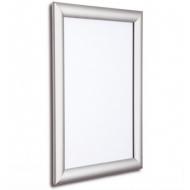 Our A2 Snap Frames can be displayed landscape or portrait. A2 Black Key Lockable Notice Board, 45mm. For posters of 420mm x 594mm. Our A2 Lockable..
A2 Black Snap Frame, 25mm. For a poster that is 420mm x 594mm. Our A2 Black Snap 25mm Frames ..
A2 Black Snap Frame, 32mm. For a poster that is 594mm x 420mm. Our A2 Black 32mm Snap Frames ..
A2 Blue Snap Frame, 25mm. For a poster that is 420mm x 594mm. Our A2 Blue 25mm Snap Frames cl..
A2 Blue Snap Frame, 32mm. For a poster that is 594mm x 420mm. Our A2 Blue 32mm Snap Frames cl..
A2 Cream Snap Frame, 25mm. For a poster that is 420mm x 594mm. Our Yellow Snap Frames are premiu..
A2 Double Coloured Black and Silver 40mm Snap Frames, for a poster that is 420mm x 594mm. Our..
A2 Double Sided Smart LED Light Box - Illuminated Snap Frame An excellent option for displayi..
A2 Double Sided Aluminium Silver Suspended Snap Frame, 25mm. For posters of 420mm x 594mm Our..
A2 LED Edge Lit Light Snap Frame. For posters 420mm x 594mm. This frame provides bright and e..
A2 Lockable Black Snap Frame, 32mm. For a poster that is 420mm x 594mm. Our A2 Lockable Black..
A2 Lockable Blue Snap Frame, 32mm, for a poster that is 420mm x 594mm. Our A2 Locking 32mm Sn..
A2 Lockable Green Snap Frame, 32mm. for a poster that is 420mm x 594mm. Our A2 Lockable Green..
A2 Lockable Red Snap Frame, 32mm. for a poster that is 420mm x 594mm. Our A2 Lockable Red 32mm S..
A2 Lockable White Snap Frame, 32mm. for a poster that is 420mm x 594mm. Our A2 White Lockable..
A2 Oak, Dark Wood Effect Lockable Snap Frame, 32mm. To display a poster of 420mm x 594mm. Our..
A2 Oak, Dark Wood Effect Snap Frame, 25mm. For a poster that is 420mm x 594mm. Our A2 Oak, Da..
A2 Oak, Dark Wood Effect Snap Frame, 32mm. For a poster that is 594mm x 420mm. Our A2 Oak, Da..
A2 Over-Sized Replacement Anti Glare Cover Sheets for Snap Clip Poster Frames are perfect for ref..